Drones are both fun and practical and you’ll be amazed at the camera footage you’ll get from so high in the sky. Whether you’re looking for a drone for a complete novice, a child or you’re looking for something with a few extra features, check out Gifted Geek’s buying guide below. The drones listed below have all been independently chosen by the awesome folks here at Gifted Geek. The longer your drone can hold its charge and stay up in the air, the better! You’ll be surprised how quickly time flys when you’re having fun, be sure to find a product that has enough battery capacity to stay aloft long enough. Some batteries take only 30 minutes to reach a full charge, while others take many hours. Consider the charging time if you want to do lots of flying but don’t want to pay for extra batteries. The range of the drone is important, the higher and further you can fly your device, the more you can do with it. Kid’s drones may only have a range of several hundred feet while a top-of-range drone can travel miles! Cameras are required if you want to record a video or take photos. Does the drone have a camera? Is it a built-in device or can you attach your own camera, such as a GoPro? Is the camera full HD? Look out for this cool feature if you intend to fly your drone high and far. With the touch of a single button, the drone will automatically return to its launch location so you can retrieve it safely. Does the drone have its own controller or is it app-based? App-based controllers are fun and help to reduce costs but better quality drones typically have their own dedicated controller. Don’t forget to check how fast the drone can go, especially if you intend to fly with friends. The faster the drone can fly, the more fun you’ll have. Some drones are even suitable for racing. With live video you can see a live feed directly from the drone, this is displayed either on a dedicated screen or via a Smartphone app. This feature is perfect for those of you that want to fly the device far and high or to get close to a specific object. A “Follow Me” feature does exactly as it says on the tin – the drone will automatically follow the user without any manual control inputs. Sportspeople such as climbers often use this feature to get great action footage of themselves. Noise levels vary from drone to drone, if you want to record yourself talking to the camera, you’ll probably want to pay close attention to how much noise the rotors produce. Brushless motors are generally the quietest. We’ve scoured the web and found what we feel are the best drones for newbies. 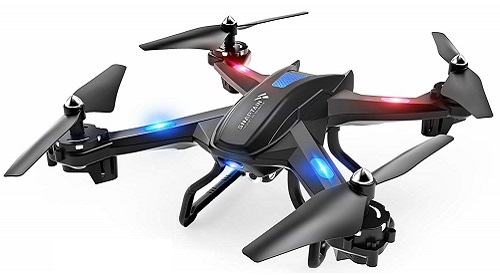 We’ve selected what we feel are the best drones for beginners and these are easy to learn and feature all the essentials and are priced reasonably. 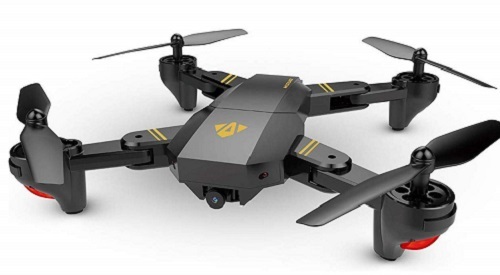 These drones are perfect for travellers and those that want a small or foldable drone that will tuck away easily in your carry bag. Our selection of mid range drones feature high quality cameras, longer life batteries, a better range and lots of user-friendly features. Safety is key when choosing a drone that’s suitable for children. Check out our chosen products that can be used indoors and by children of almost any age. It’s a user friendly drone. It provides a video transmission up to 80 meters. You can edit videos on social media via the iPhone or edit and upload video transmissions up to 720p. Edit HD videos and upload them to your social media from your iPhone or iPad. Advanced hold functions provide stable hovering at specific altitudes. With this feature you can take great aerial photos and videos. It saves video clips to the Micro SD card. Trajectory flight is the latest technology that allows drones to fly by tracking the flight paths on the touch screen of a smartphone. Pure pleasure is waiting! Using the GPS system installed, you can get information about location of the drone that is accurate. Built-in (RTH) returns home function helps the drone have a safe flight. This means that when the battery is low or the signal is weak during the flight, the drone returns home. For high quality images and videos, the 1080p HD GPS camera can take a picture of a wide-angle lens at 120 ° adjustable angle up to 75 °. No matter where you move, the drone will follow you. It has a controlled distance of 300 meters, providing a longer flight experience, with a smart battery of 15 minutes of flight time. 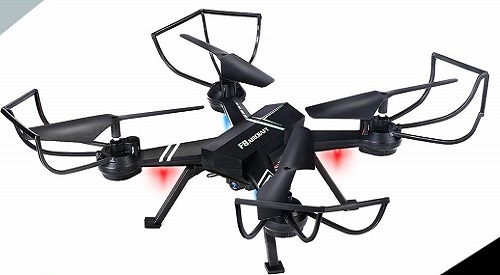 It has a 5.8 GHz analog signal and a 2.4 GHz operating frequency, and real-time video and aerial photography, transmitted in real time in a smooth and fast manner. This allows you to record or capture photos with steady signals over long distances. 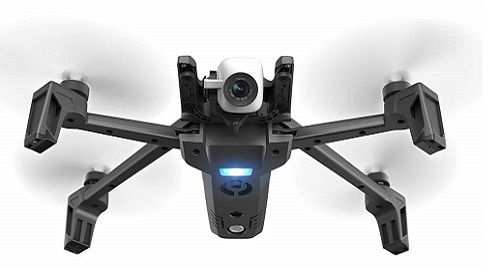 With a modular HD 720P wide-angle 120 ° wide-angle camera, you can record live HD video and photos from a particular angle with a high-speed FPV drone race. Modular cameras are easy to install and move. 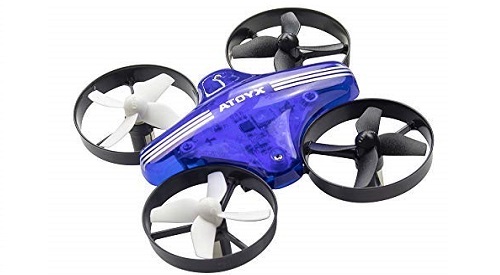 The racing drone has a top speed of 45 km / h: a powerful engine, a smooth and clean drone body designed to reduce wind resistance and improve the feel of the air. Choose from three speed modes from low to high. Modular reward battery: ensures security for use and charging. It doubles flight time with two high performance batteries. The JoyGeek camera drone has aerial photos in 480p. It removes the distance constraint and allows you to view the Real Shot Clear scene in real time in the application. Application Control and Trajectory Flight connects with the mobile application through WIFI connection for real-time control. You enjoy both operating experiences of mobile phones and remote controls. When you release the hand, the aircraft automatically adjusts the height and the hover. The pictures taken are clearer and you will not miss this moment. The JoyGeek quad copter automatically recognises the direction of the remote control and can use it directly. The 5G 1300FT transmission guarantees a high quality live video – ideal for selfie. Once the positioning is compatible with the GPS, the drone will return home automatically when the battery is low, or the signal is weak. 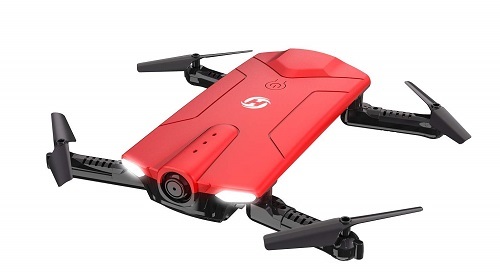 Equipped with A 2800MAH intelligent battery of large capacity and can take up to 20 minutes of flight. There is also a low power alarm. You can devote yourself to a lot of flights. Faults rarely occur and there is little need to replace the motor. You can start quickly by pressing a button. Also, install the quick release propellers without screws. It allows you to focus on controlling the camera and taking more complex shots as it gains a stable flight at a locked altitude. 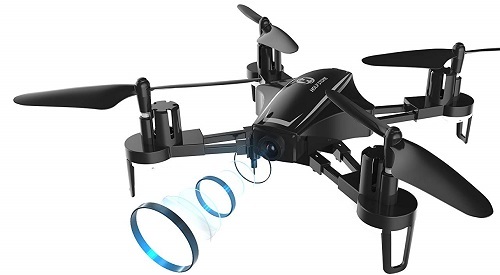 This drone is equiped it with a HD 1080p camera along with a 5.8 GHz FPV transmitter, an advanced hold function, and intelligent one-touch video take-off feature. 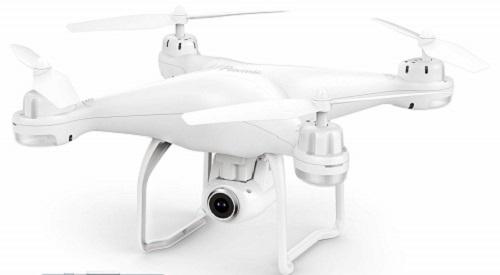 It has a built-in high quality display, with an auto return and headless mode to help the drone return safely. The 6-axis flight system allows the drone to become more stable and flies smoothly to prevent its loss. The remote control is a standard left and right scroll that increases in pitch up and down and is easy to use. The GPS function keeps the drone still when you release all controls. The drone is 4K HDR flying camera you can take with you. It takes less than three seconds to unfold and made from a lightweight carbon. 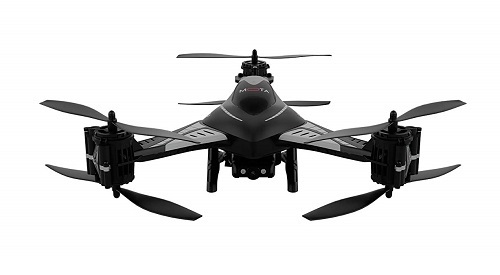 This ultra-compact UAV has flight duration of 25 minutes and a photo quality above 21 MP. With its USB-C charging system, you can charge your Parrot drone anytime, anywhere. They equip ANAFI with a folding controller. The Parrot Sky Controller 3 and its 180 degree vertical tilt joints are ideal for low angle shooting. ANAFI is a smaller and quieter consumer drone. The drone can limit its flight to a pre-defined zone and use its automatic GPS flight to return to its last synchronised position. You can check the connection using the GPS phone icon in the app. If it display the GPS icon in red, it means that it has not received the GPS signal. Therefore, returning to the home page function will return the drone to the previously registered location. The drone has a better design compared to most drones sold today. 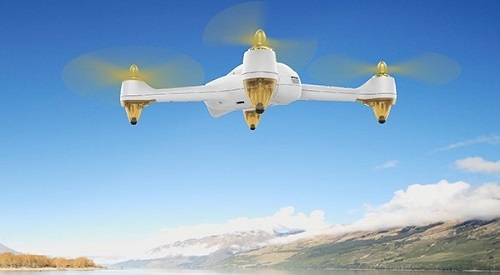 Besides its power, it has a slender profile, suitable for most unmanned reconnaissance aircraft: everyone can easily navigate it, perform a remote inspection, monitoring and other commercial applications with the drone. It is suitable for industrial applications, mainly because they are affordable. It allows good visibility and the headlights ensure night flights are effective. Energy workers can use live stream to identify problems using such drones in places such as cable lines. By maintaining the altitude, the drone can fly over an altitude for a more stable flight and more stable aerial photo shots. You can deploy and install the propeller fairing when ready to fly. It is a lightweight device and has a durable design, enough for beginners and children. In headless mode, a button returns comfortably to fly. Regardless of the angle of the aircraft in flight, it is easy to control the direction from a distance. 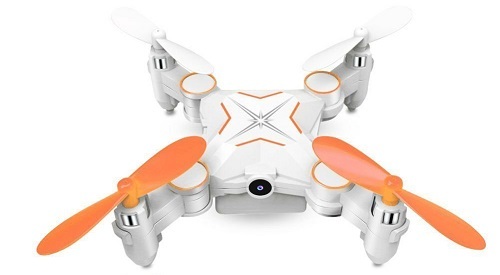 In G-sensor mode, the small quad copter can automatically follow the movements of the smartphone. With high / low speed mode and 3D Flip function, you can enjoy a pleasant flight experience. You can choose between low speed and high speed outdoors for more fun in flight. You can keep this 4-axis folding drone in your pockets. To experience another perspective, you can put your phone in a VR box or wear VR glasses. It offers Real-time image and video transmission. 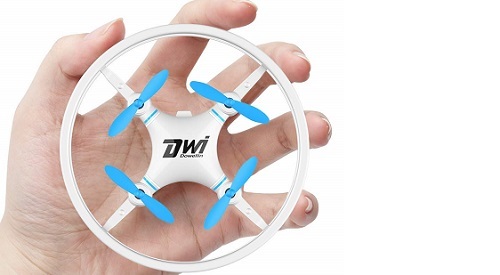 Allows you to connect to the Wi-Fi of the drone to control the flight and take pictures at the same time. Remote transmission at 2.4 GHz takes longer to make interference less sensitive. This drone has a non-changeable battery and you can charge it with its charger or a cell phone charger. When you draw a flight plan on the screen, the drone will handle it as a route. Once activated, the pilot can fly the drone anywhere without worrying about the direction in which the drone faces. 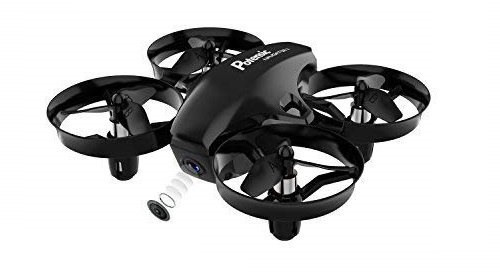 It offers Take-off and landing in one touch: The drone flies at a certain height and lands automatically on the ground at the push of a button which allows for any player of any level to fly it easily. 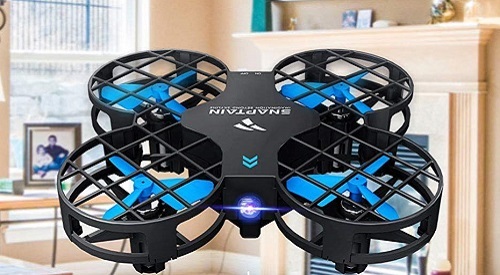 You can also use your phone to control the drone, and the gravity detection mode lets you move the mini drone in the directions of your mobile phone. It is perfect for beginners, children and amateurs. Using a mobile phone to control the drone, the gravity detection mode allows you to navigate the mini drone toward the mobile phone. When you draw a flight plan on the screen, the drone will handled it as a route. Once activated, the pilot can navigate the drone anywhere without worrying about the direction in which the drone is. When realising the throttle, you lock the mini drone at a certain height. This facilitates control and stabilisation of the camera drones for aerial photography and video recording. The high-quality anti-collision ring design reduces the effects of the drones damage and better protects the propeller and engine. Plus, it is a lightweight, remote-controlled drone with a carrying case. 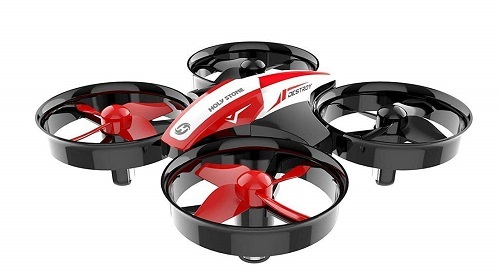 An important take-off and landing button facilitates the flight of these remote quad copter drones, and you will not have to wonder how to take off or land it. You can do everything with a specific button. It is fantastic for beginners. They install it with a 720p HD camera for aerial photos and videos. It stores Images and videos in apps and mobile photo albums. Players of all levels can easily fly the drone with perfect control and outstanding performance. They equip the drone with two powerful 3.7 V 500 mAh modular batteries, including a bonus that allows you extended flight times. Its modular design ensures safe charging and storage. They make it of foldable and flexible blades which make the drone smaller and more portable. The ingenious portable design provides a safer flying experience. Releasing the drones throttle allows it to move to a specific height.The 6-axis gyroscope flight control system provides a powerful and exciting 360 ° turning effects. You are the pilot in the headless mode. The drone can take off, land, or return by immediately pressing a button. Have super-responsive motors with a 3-speed control to meet the needs of beginners, intermediate users and experts. Because it has a mini pocket size, it’s easy to carry. The barometric altitude backup mode helps the drone maintain a constant height. The user can control the pitch and tilt angle, roll and direction. 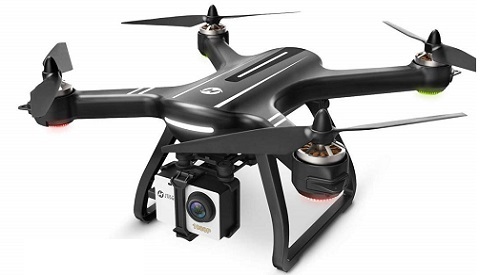 You can allow this drone to fly over the current altitude by the Auto-hovering feature. You can release the throttle and control the drone more easily. You can decide the speed depending on your operating capabilities. The working range of the drone is about 80 meters per 6 to 7 minutes of charge. When the wind is too strong, do not fly it. With the latest technology in 6-axis gyroscope flight control system, it can achieve a very stable 3D tilt with a single button, making it easy to use for beginners. In headless mode, especially when the drone is away, you can navigate the drone without worrying about the direction the drone is facing.